Small volumes of IL10 elisa kit vial(s) may occasionally become entrapped in the seal of the product vial during shipment and storage. If necessary, briefly centrifuge the vial on a tabletop centrifuge to dislodge any liquid in the container`s cap. Certain products may require to ship with dry ice and additional dry ice fee may apply. MBS175998 is a ready-to-use microwell, strip plate ELISA (enzyme-linked immunosorbent assay) Kit for analyzing the presence of the IL-10 (IL10) ELISA Kit target analytes in biological samples. The concentration gradients of the kit standards or positive controls render a theoretical kit detection range in biological research samples containing IL10. The ELISA analytical biochemical technique of the MBS175998 kit is based on IL10 antibody-IL10 antigen interactions (immunosorbency) and an HRP colorimetric detection system to detect IL10 antigen targets in samples. 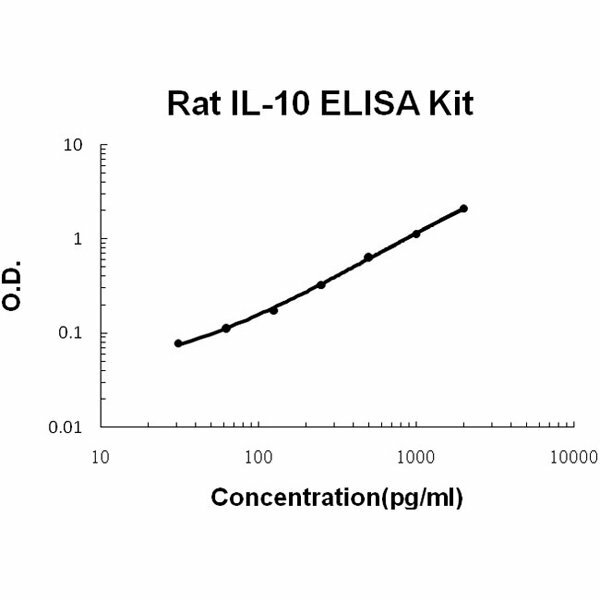 The ELISA Kit is designed to detect native, not recombinant, IL10. Appropriate sample types may include undiluted body fluids and/or tissue homogenates, secretions. Quality control assays assessing reproducibility identified the intra-assay CV (%) and inter-assay CV(%). Principle of the assay: rat IL-10 ELISA Kit was based on standard sandwich enzyme-linked immune-sorbent assay technology. A monoclonal antibody from mouse specific for IL-10 has been precoated onto 96-well plates. Standards (E.coli,S19-N178) and test samples are added to the wells, a biotinylated detection polyclonal antibody from goat specific for IL-10 is added subsequently and then followed by washing with PBS or TBS buffer. Avidin-Biotin-Peroxidase Complex was added and unbound conjugates were washed away with PBS or TBS buffer. HRP substrate TMB was used to visualize HRP enzymatic reaction. TMB was catalyzed by HRP to produce a blue color product that changed into yellow after adding acidic stop solution. The density of yellow is proportional to the rat IL-10 amount of sample captured in plate. Background: Interleukin-10, also called cytokine synthesis inhibitory factor, is implicated in tumorigenesis, and it has been shown that polymorphisms in its gene promoter correlate with differential amounts of production.1 IL-10 is animportant cytokine with anti-inflammatory, anti-immune, and antifibrotic functions.2 It is also an important regulatorycytokine whose involvement extends into diverse areas of the human immune system.3 IL-10 is a recentlydescribed natural endogenous immunosuppressive cytokine that has been identified in human, murine, and other organisms. IL-10 significantly affects chemokine biology, because human IL-10 inhibits chemokine production and is a specific chemotactic factor for CD8+ T cells. It suppresses the ability of CD4+ T cells, but not CD8+ T cells, to migrate in response to IL-8.4 Interleukin-10 gene polymorphisms and interleukin-10 production capability maycontribute to the development of skin squamous cell carcinomas after renal transplantation.1 The interleukin-10locus contributes to the heritability of psoriasis susceptibility.5 With regard to sudden infant death, IL-10 is ofspecial interest. This is an immunoregulatory cytokine that plays an important role in the development of infectious disease.6 The mIL-10 gene is mapped to mouse chromosome 1 and the hIL-10 gene is also mapped to humanchromosome 1.7. NCBI/Uniprot data below describe general gene information for IL10. It may not necessarily be applicable to this product. 1. Daily treatment with anti-IL10 antibody significantly increased paw edema.